The other day I had a chat with a real estate agent who kept mentioning how local real estate is and how the city wide average price doesn't tell the whole story. He's got a point. Just because Toronto's average condo prices went down by 4% last month does not mean that in every area of the city prices went down by that much. The opposite is also true, if condos went up by 6%, it doesn't really mean that in all neighborhoods of the city prices went up by that much either. If you zoom in further, and look at downtown core, you will see that west of Yonge street average condo prices went down by $5000 (less than 1%) last February and east of Yonge average condo prices went down by over $30000 (near 4%). Now that doesn't really mean that all condos lost 1% west of Young and all the condos on the east side lost 4%. So why then bother reporting the average house price for the city as a whole? Because it shows a trend. Last month city prices for all types of houses went up by $1500 on year to year basis. If you dig deeper you will see that detached houses in the city of Toronto went up by about $5000 and condo apartments fell by $18000. Now you may ask: where is a trend? The trend is that condos in Toronto have been declining for the past five months. As is usually the case, cheap units like condos fall first in price before free standing houses start to decline. This was the case back in the 90s when condos were the first to fall, and kept declining more than any other type of real estate in Toronto. 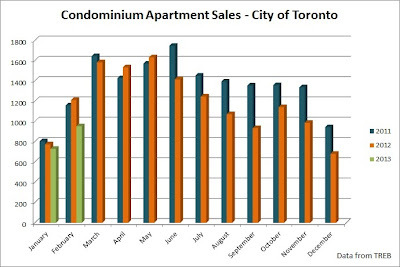 Sales fall first, cheap units (condos) fall second, than all other unit types follow. Now will the trend of early 90s repeat itself this year? 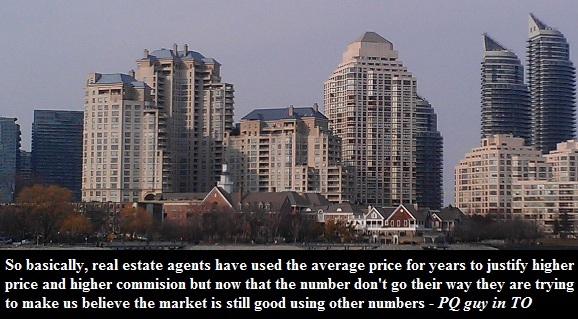 Will Toronto condo bubble burst in 2013? So far it definitely seems so. Yesterday the same real estate agent emailed me this article - "Average House prices don't tell the whole story". If real estate — as the saying goes — is really about "location, location, location," then average prices frequently don’t capture the reality of what's going on in a particular city or neighbourhood. Calculating the average house price is as simple as adding up the prices realized for all home sales in a particular month and dividing by the number of sales. The problem with that metric begins to emerge, however, when one or more parts of the housing market don't act in tandem with all the other segments, as they seldom do. For instance, what happens if the percentage of really expensive homes sold drops more than it does for other types of homes? That could lead to a big drop in the average selling price, even though the price of more moderate homes may be little changed. Average home prices for a city or a neighborhood definitely doesn't tell the whole story. May as well look at median prices and benchmark index which TREB publishes. Yet, it is funny how real estate cartel doesn't mind using average benchmark for the city or a country as a whole when prices go up, but once prices flatline or start declining suddenly a problem arises with averaging home prices.